Vancouver, BC - Skyharbour Resources Ltd. (TSX-V: SYH) (OTCQB: SYHBF) (Frankfurt: SC1P) (the “Company”) announces that it has arranged and closed a non-brokered private placement of 1,000,000 flow-through shares (the “FT Shares”) at a price of CAD $0.60 per FT Share, for total gross proceeds of CAD $600,000. A strategic, institutional investor subscribed for the full amount of the financing. 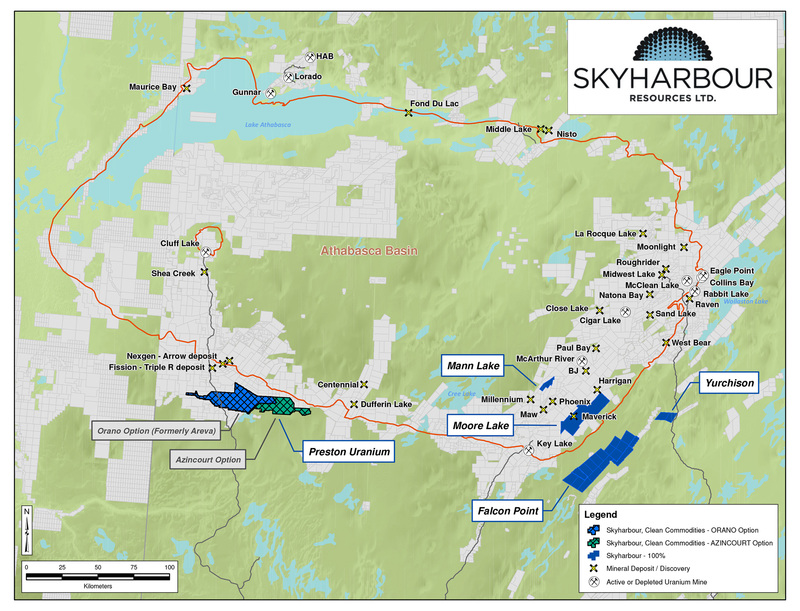 Skyharbour intends to utilize the proceeds from this private placement for exploration and diamond drilling at the Moore Uranium project. The Company is fully funded for multiple upcoming diamond drill programs at its flagship Moore Uranium project located on the southeast side of the Athabasca Basin proximal to regional infrastructure, as well as nearby development projects and producing mines. In connection with the financing, Skyharbour issued a total of ­70,000 warrants to finders (the “Finder’s Warrants”) who introduced certain subscribers to the private placement. Each Finder's Warrant will entitle the finder to purchase one additional common share for two (2) years at a price of CAD $0.75 per common share. The Company also paid to finders a total of CAD $42,000 in cash fees associated with this financing. The private placement is subject to TSX Venture Exchange approval, and all securities are subject to a four-month hold period. Further, the Company announces an amendment to the amount of finders fees paid pursuant to the financing closed on April 18, 2017. The Company issued an aggregate of 127,322 Finder’s Warrants and paid a total $85,948.30. Details of the Finder’s Warrants can be found on the Company’s news release issued April 18, 2017.